Our Best Value Yet in Pro Sound!!! Introducing The DIGITAL AUDIO 2002 PRO SOUND LINE - Your best buy in speakers for DJ,P.A., Karaoke, Nightclubs, Churches, or for professional use on the Road. 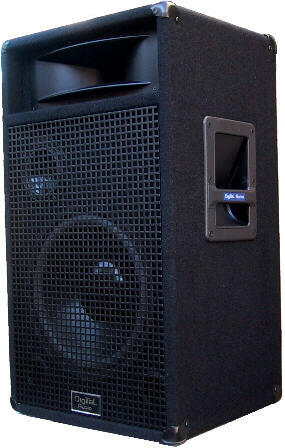 12 inch low ferquency drivers in a tuned-port tower cabinet - delivers VERY Solid bass!!! A Wide dispersion horn smoothly broadcasts the high frequencies, while a special 4" driver definitively projects the midrange. The Big Kid on the Block!! Tuned Cabinet - Very Powerful Bass! 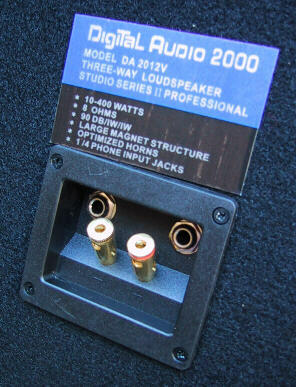 An Excellent Deal on Pro Sound - The DIGITAL AUDIO 2002 P.A. Speakers, featuring 12" Super-Heavy Duty polymer treated Woofers, Special 4" Midrange Drivers and Professional Grade Wide Dispersion Horns, all in a Rugged, Roadworthy Carpeted Enclosure. SPECIAL: ONLY $269 a PAIR!!! "A much higher quality sound than you'd expect for the price; You'll be very pleased at how much money you've saved by shopping FactoryDirect!" Versatility: Here's what the Input/Output Jacks look like. You've got 2 quarter-inch jacks, so you can string multiple speakers together in parallel, and also regular red-and-black, gold-plated 5 way binding posts, to connect to bare wire leads.. The Heavy-duty, Gold-Plated 5-way Binding Post Terminals color-coded Red (+) and Black (-) allow these Professional, Roadworthy cabinets to be connected to any amplifier, stereo, surround-sound or home-theater system, big-screen TV, or other source of amplification. With their 12" polymer-treated concave long-throw woofers, these rugged professional cabinets pack an extremely powerful bass response! "Quality Components deliver Quality Sound..."
Wide Dispersion Horn tweeters provide a wonderfully smooth and accurate projection of the high frequency portions of the signal. We will stand the DIGITAL AUDIO 2002 Pro Sound speakers up against any competition, and dollar for decibel, come out far ahead of the pack. We know what makes a good sounding speaker and one that just looks cool. You'll be very pleased with the extremely Rich Sound - Guaranteed! "When you stack them up against the competition, the choice is easy..."
These fine loudspeakers are pleasing both sonically and aesthetically, and have often been observed to make even an average system sound much better than would have been thought possible! The sturdy and very handsome ported black carpeted bass reflex cabinets will definitely complement your stage, nightclub, entertaining or even living space! Often sold for much, much more, these are, through a special arrangement, available to you right now from FactoryDirect for the incredible price of only $269 per pair! Add $29 for Packing, Shipping and Handling for a total, delivered to your door price of only $298 per pair! DIGITAL AUDIO 2002 Pro-Sound 3-way Cabinets with Super-Heavy-Duty 12" woofers, 4" High SPL Midrange Transducers, and Wide Dispersion Horns, in Handsome, Roadworthy, Tuned, Carpeted Enclosures, featuring Steel corners, and Recessed Handles.